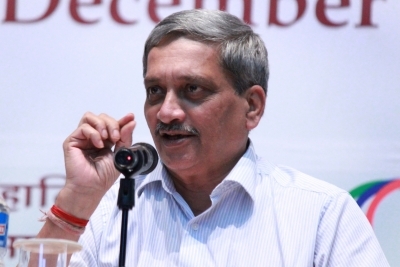 Did Parrikar government just survive a coup? News Did Parrikar government just survive a coup? Panaji, May 14 (IANS) Goa Chief Minister Manohar Parrikar may have just managed to quell a coup. The Congress, fresh from its sacking of Digvijaya Singh as a central overseer, made fresh overtures to allies in the Bharatiya Janata Party-led ministry in a bid to topple the Parrikar government. While both the Goa Forward and Maharashtrawadi Gomantak Party (MGP), which have three seats each in the 38-member (an MLA each from the BJP and Congress have resigned) have rejected reports of a coup and the BJP on Saturday claimed the government is stable, Goa’s politics appears primed to replay its mercurial and unstable edge of the 1990-2000 decade — when the state saw 14 Chief Ministers. The fresh developments, during which the Congress claimed to have been in touch with several BJP MLAs and the BJP counter-claiming that 10 Congress legislators were in touch with its leadership, have, however, ended with some egg on the face of state Congress President and legislator Luizinho Faleiro. Faleiro’s leadership has again been challenged by a section of Congress MLAs. Congress sources said they had re-established contact with Goa Forward founder-member and now Town and Country Planning Minister Vijai Sardesai and two Independent MLAs in a bid to win him over. “His condition to joining a Congress-led government continues to be the same as it was before he joined the BJP-led formation in March. He wants Faleiro out of the decision-making hierarchy. He wanted our MLA Digambar Kamat (former Chief Minister) in charge of negotiations and as the coalition leader,” a senior party leader told IANS. The party official also said that efforts to topple the BJP-led coalition government had been intensified following A. Chellakumar’s promotion as Congress General Secretary in charge of Goa. He was earlier an understudy to Digvijay Singh, who was unceremoniously sacked a few weeks back. Faleiro, a two-time Chief Minister, led the Congress campaign in the February 4 polls. But his running feud with Sardesai could have cost the Congress the opportunity to stake claim to form government despite the party emerging with 17 seats of the 40 Goa assembly seats. Sardesai is known to have more than cordial relations with Kamat. Both politicians have successfully partnered together in the municipal elections in Margao, a major South Goa township. The loyalty of Congress legislators appear to be split between Kamat and Faleiro although the Congress formally has denied any rift and Faleiro has even offered to surrender his rank for the health of the party. “I am ready to quit any position for the party… If even one MLA feels that we can form a government and that it (my resignation) will help and facilitate that, then I am ready to quit,” Faleiro said. With Congress MLA Vishwajeet Rane resigning on March 13 and becoming the Health Minister in the Parrikar cabinet, the Congress needs five MLAs to obtain a simple majority and therefore the support of Goa Forward with its three MLAs and two Independents helps the party make the numeric cut. But Sardesai, who led the poll campaign and canvassed for votes in the Catholic-dominated areas on an anti-BJP pitch, now claims his support to the BJP and Parrikar is unequivocal and he would never betray the latter. “Parrikar gave up his ministry in Delhi on our word. I will never let him down. This government is stable and it will last its full term,” he said. The BJP too has strongly refuted reports of a coup, with its state President Vinay Tendulkar insisting that in fact the Congress which is in turmoil. “This government will continue full-strength and last its full five year term,” Tendulkar told IANS.